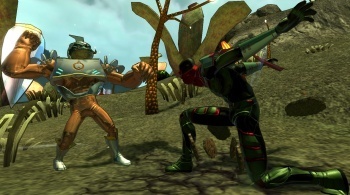 Cryptic Studios has dropped plans to develop an Xbox 360 version of the superhero MMOG Champions Online, saying its efforts are totally focused on the PC edition of the game. Originally planned for release on both the PC and Xbox 360, Champions Online would have been one of the few MMOGs available to console gamers, a potentially huge and yet almost entirely untapped market. Cryptic COO Jack Emmert said back in August 2009 that the 360 version of the game was "ready to go" but while the PC edition came out in September, it looks like console clobberin' time is over before it even began. The first hint of trouble came earlier this month when it was revealed that Executive Producer Bill Roper had left the game to take on "other responsibilities" at Cryptic, which led to questions about the future of the game in the Champions Online forum. After some back-and-forth, a Cryptic rep going by the name "Jackalope" wrote, "100% of our focus is on making the current PC product the best it can be. There are no current plans for a console version of Champions." It's a bit surprising that this kind of information would be revealed in such a casual and off-handed manner, as several follow-up posters noted, especially since it had been planned for the 360 right from the start. Of course, it's still possible that the game could end up there someday - the "no current plans" caveat leaves the door open - but unless Champions Online grows into a major mainstream success, gamers who want to don a cape and punch out bad guys for fun will have to use a mouse and keyboard to do it.